Whenever I go into assess a client with a back issue, 70% of the time they are slouching over at their desk and wondering why they are experiencing pain in their neck, shoulders and lower back. It is hard to remember to sit up straight all day long, as it is a natural tendency to lean over as we concentrate on our work. Indeed, I often do the same, but I quickly remember to sit back up, as I know the consequences of holding this posture for too long and too often! Having suffered a few back injuries along the way, I know personally the benefit of avoiding compacting down on the spine – if you can avoid doing this, your recovery process which be faster. 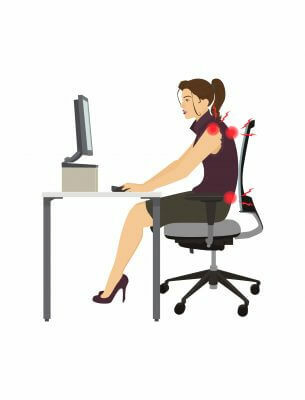 So if you have a long term issue, such as spondylosis, fibromyalgia, frozen shoulder, RSI, Arthritis, scoliosis, slipped disc, or are just getting pressure build up through the day, it can be hugely beneficial to correct your sitting posture. Are you using a laptop for more than an hour or two at a time? If so, RAISE IT! Try and raise it up closer to eye level height and use a separate keyboard and mouse. Are the armrests of your office chair too long and obstructing access to your desk? 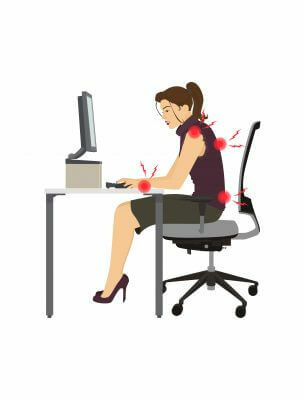 If so, this will stop you from being able to sit back in the chair, using the armrests (to relieve tension in your shoulders) whilst still comfortable using the keyboard and mouse, so consider changing your chair. Do you do a lot of paperwork? If you do, consider using a horizontal document holder to raise the height of your paper work and reduce the need to lean down to read it. Is your office chair at the right height? Too low or too high and it will encourage a slouch, so do take a few moments to check it is set at the right height for you in conjunction with the desk height. Take a break! Just standing up, even for a minute or two, every hour, will nourish your muscles and spine, and do take a lunch break wherever possible, away from your desk. And remember the importance of exercise is real, with long term benefits to not only your general health, but your back health too. Movement is your friend, repeated long term static posture is your enemy!